WARNING: Cancer and Reproductive Harm www.P65Warnings.ca.gov. 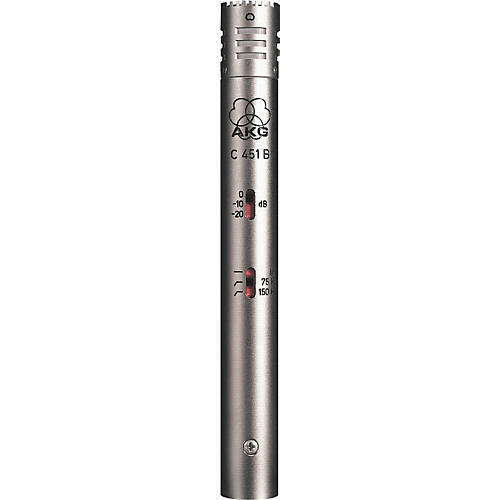 The predecessor to the AKG C 451 B microphone was the classic C 451 EB + CK1 studio mic that was a bestseller discontinued in '93. The C 451 B mic provides identical acoustical behavior to the CK1, with dramatically improved specs. It features a precise, nearly frequency-independent cardioid pattern, a transformerless output stage, selectable 10dB and 20dB preattenuation pads, and switchable high-pass filter. Operates on phantom power. AKG includes a stand adapter and windscreen with the C 451 B microphone. 3-year warranty. AKG Acoustics warrants AKG products against defects in material or workmanship for a period of two years from the date of original purchase, and agrees to repair or, at our option replace any defective unit without charge for either parts or labor. AKG grants a three-year warranty covering selected products (C 12 VR, C 414 B-ULS, C 414 B-TLII, C 414 B-XLS, C 414 B-XLII, C 426 B, C 451 B, C 480 B, C 391 B, C 1000 B, C 2000 S, C 3000 B, C 4000 B, C 4500 B, SolidTube) against defects in material and workmanship. Warranty is valid for AKG products purchased and delivered within the United States for the original purchaser only. The purchaser's Bill of Sale will serve as proof of sale and warranty validity in the U.S. Shipment of defective items to AKG for repair will be at the customer's own risk and expense. AKG will assume the return shipping cost for all items repaired under warranty. IMPORTANT: This warranty does not cover damage resulting from accident, misuse or abuse, lack of reasonable care, the affixing of any attachment not provided with the product, loss of parts, or connecting the product to any receptacle other than specified. This warranty is void unless AKG Acoustics, U.S.'s service center performs the repair. No responsibility is assumed for any special, incidental or consequential damages caused by the consumer. However, the limitation of any right or remedy shall not be effective where law prohibits such.